Taste test: The first thing that I noticed about these chips upon opening the bag was how big they were. These are some big chips. There's a sweet onion flavor to them, but not a whole lot of sour cream flavor that I could notice. 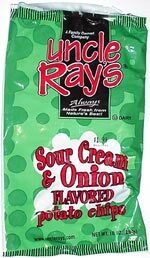 If you like a sweet onion taste, they're probably a good choice, but don't expect the authentic flavor of a real sour cream and onion chip, because you'll be disappointed. From the package: “I was seventeen years old before I joined the Navy in September 1955. Beforte that I had been working in a foundry, but the Navy was more than just a place to get away from coal dust. My three years in the service were very special to me, and bring back a lot of fond memories. "My entry into the food industry came aboard the USS Bristol, a destroyer, where I was a cook and baker. It was there that I learned what to do when life hands you lemons  or when life accidentally boils the meat off twelve turkeys hours before Thanksgiving dinner. "The night before, I had placed the turkeys inside three very large steam jacket kettles to thaw. The valve leaked, and on Thanksgiving morning 1957, I found a dozen bare turkeys. "Dinner was at noon. With no time to thaw more turkeys, I took the meat that had fallen from the bones and placed it in several deep roasting pans. Then I melted twenty pounds of butter, poured it over the turkey meat and added poultry seasoning and salt. I placed the turkey in the oven at 300 degrees. "Meanwhile, I used the water and drippings from the kettles to make turkey noodle soup and gravy, with a little left over to use in the dressing. We had cranberry souace, mixed vegetables, hot rolls, tossed salad, and pumpkin pie for dessert. "After dinner a line of more than one hundreds officers, crewmen and wives came by the gallery to compliment the meal  especially the moist, tender turkey. "Life has taught me to improvise in many ways, but one place where there is no compromise is quality. We get our special select potatoes in truckloads of 46,000 to 49,000 pounds. If a load of potatoes doesn't meet our standards, we will shut down the factory for the day. "We know you have a choice when choosing potato chips. This snack was discovered by Jeremy at Dollar Tree.